Are the roots of a favorite Russian dish in the navy’s traditions? 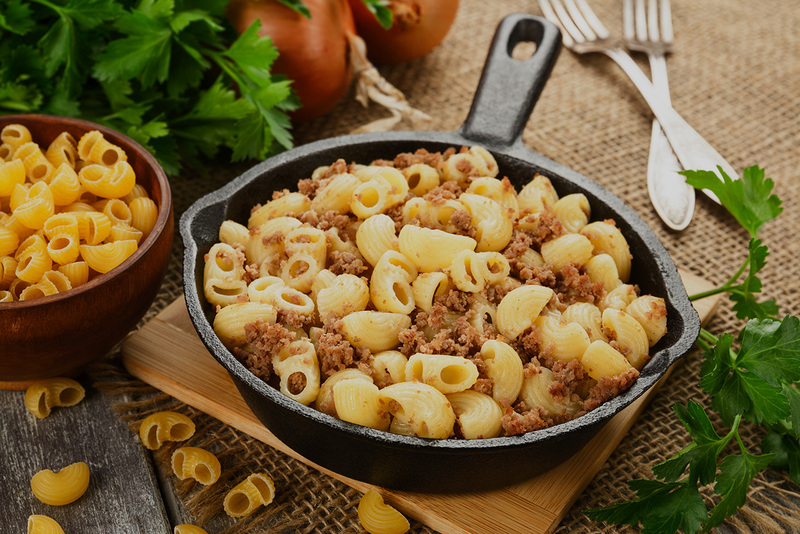 Everyone in Russia knows Fleet Macaroni, or the Soviet pasta bolognese, as this dish is sometimes called. But what's it got to do with the Russian Navy? In terms of popularity Fleet Macaroni gives way only to the acclaimed Olivier Salad or the holiday French-style Meat - pork or veal with potatoes and onions, covered by a think layer of cheese and mayonnaise and baked in an oven. And just like these Russian cuisine superstars, Fleet Macaroni is very satisfying, easy to prepare and made with inexpensive ingredients. The most common theory on how the dish got its name says that Russian sailors tasted pasta bolognese overseas and liked it so much that they asked the ship's cook to make it for them. As they sailed the oceans, they forgot the dish's original taste and the thrifty cook intentionally simplified the recipe. In any case, what they brought back home was completely different. Another theory is related to the play on words and to Italy, and it says that the dish was invented in the poor regions of the country's north and was called fiotarini, which sounds like the word "fleet." Travelling Russian merchant did not want to twist their tongues on the incomprehensible foreign word and named it Fleet Macaroni. Others, however, are convinced that Fleet Macaroni is a Soviet invention. Its first official mentioning was in 1955 when the recipe appeared in the USSR's official cookbook published by the Food Industry Ministry. Afterwards, Fleet Macaroni occupied a well-deserved place in all cookbooks and today it’s impossible to imagine a book of Russian and Soviet recipes without it. Soviet supermarkets even sold cans of Fleet Macaroni for instant preparation. Scientist Boris Chertok, who was one of the founders of the space industry and a close collaborator of academician Sergei Korolev, recalls in his biography, Rockets and People: Creating a Rocket Industry, that in 1955 they took a journey on the first Soviet submarine propelled by a rocket engine. When it came time to have lunch, the scientists were invited to the wardroom where they were offered herring and Fleet Macaroni. Korolev liked the lunch very much and told the submarine's captain that with this kind of food he was willing to work in the sub for three years without going ashore. And you can understand him! 1. Fry the onion in a pan until golden, add meat. 2. Boil the pasta while you fry the meat. Penne rigate is often used, but spaghetti or farfalle is also possible. 3. Prepare the pasta al dente, then mix with fried meat in the pan (which makes the dish more oily) or in the pot. Let sit and steam for a few minutes before serving. The main difference between Fleet Macaroni and Pasta Bolognese lies in the preparation. In the classic Italian dish the meat is served with tomato sauce, and is poured on the pasta on the plate. The Russian version has one advantage - the recipe offers room for culinary creativity. You can add parsley and garlic, fry tomatoes with onions, or even add mushrooms and cheese. Fleet Macaroni is a common dish on the menus of Russian catering companies, and can be found in the canteens of educational institutions, factories, military units and last but not least, the navy.